Always very drawn to the magnificent beauty within the National Parks, Eugene Kingman travelled a number of times out West to visit various parks in order to capture Nature's wonders through his oil paintings. It was during this time while he was teaching lithography and mural painting at the Rhode Island School of Design, he also created a series of lithographs of Mesa Verde. In fact, this very park happened to be the magical place where he met his wife, Elizabeth Yelm Kingman, an anthropologist and park ranger,during one of her guided tours of this park in 1938. 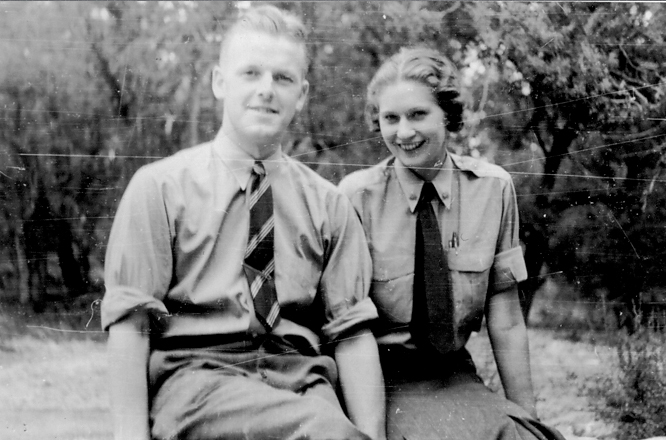 Eugene Kingman and Elizabeth Yelm at the time of their meeting in Mesa Verde, where she was working as a park ranger. With her background in anthropology and her experience working in the park, she was an enormous help to her husband and deeply influenced her husband's work throughout his artistic career and their 39 years of marriage.